Most American adults are open to the idea of exposing young girls and boys to toys and activities that are typically associated with the opposite gender. Roughly three-quarters (76%) say it is a good thing for parents of young girls to encourage them to play with toys or participate in activities that are typically associated with boys; this includes 28% who say this is a very good thing. Fewer, but still a majority (64%), say it is a good thing for parents to encourage boys to play with toys or engage in activities usually thought of as being for girls (24% say this is a very good thing). Women are more likely than men to say breaking with gender norms is a good approach to take in raising both girls and boys. Large majorities of women (80%) and men (72%) say it’s a good thing to steer girls toward boy-oriented toys and activities; women are much more likely to say this is a very good thing (34% of women compared with 21% of men). When it comes to raising boys, 71% of women but only 56% of men say it’s a good thing for parents to encourage boys to play with toys or engage in activities usually associated with girls (30% of women compared with 17% of men say this is a very good thing). There are generational differences in views on raising boys and girls, with younger generations more open to the idea of introducing young children to toys and activities that are usually associated with the opposite gender. But across generations adults are more accepting of encouraging girls to engage in boys’ activities than they are of encouraging boys to explore girl-oriented activities. Roughly eight-in-ten Millennials (81%) say it’s a good thing for parents to encourage their girls to engage in activities that are typically associated with boys, compared with 76% of Gen Xers, 72% of Boomers and 73% of members of the Silent Generation. Roughly a third of Millennials (35%) say this is a very good thing, compared with about one-in-four or fewer among older generations. Millennials (69%) and Gen Xers (67%) are more likely than Boomers (59%) and members of the Silent Generation (54%) to say it’s a good thing for parents to encourage young boys to play with toys and pursue activities normally associated with girls. Three-in-ten Millennials, compared with 12% in the Silent Generation, say this is a very good thing. There are generational differences within genders as well. Among Millennial and Gen X women, the shares saying it’s a very good thing for parents of young girls to encourage them to play with toys or do activities that are usually associated with boys (42% and 37%, respectively) are substantially higher than among women from the Baby Boom and Silent generations (28% and 22%). The patterns are similar when it comes to raising boys. Millennial men are about twice as likely as their older counterparts to say it’s a very good thing to steer girls toward male-oriented activities – 29% of Millennial men say this compared with 17% across the three other adult generations. The survey finds some evidence that the way a man views his own masculinity is related to his ideas about raising children. Among men who describe themselves as very manly or masculine, 40% say it’s a good thing for parents to encourage boys to play with toys or take part in activities that are normally associated with girls; 58% say this is a bad thing. The share saying this is a bad thing is significantly lower among men who describe themselves as somewhat manly or masculine (38%) or as not too or not at all masculine (29%). Fully 71% of men who say they are not too or not at all masculine say steering boys toward these toys and activities is a good thing. Men who see themselves as very masculine are also less enthused about encouraging girls to do things usually seen as male-oriented: 37% of very masculine men say this is a bad thing compared with 23% of men who say they are somewhat masculine and 16% of those who say they are not too or not at all masculine. Similarly, women’s own sense of femininity is tied to their views on raising children. While 70% of women who describe themselves as very feminine or womanly say it is a good thing for parents to encourage girls to play with toys and do activities that are usually associated with boys, women who don’t describe themselves this way are significantly more likely to say the same (85%); 24% of women who describe themselves as very feminine or womanly say this is a very good thing compared with 38% who say they are somewhat feminine and 41% who say they are not too or not at all feminine. Women who say they are very feminine are also more resistant than other women to the idea of steering boys toward toys and activities that are most often associated with girls – 37% of very feminine women say this is a bad thing compared with 24% of women who say they are somewhat feminine and 20% who describe themselves as not too or not at all feminine. Beyond gender and generation there are significant partisan gaps in views about raising girls and boys. Democrats are much more in favor of the idea of exposing girls and boys to toys and activities normally associated with the opposite gender. Overall, 85% of Democrats say it’s a good thing for parents to encourage girls to do things normally associated with boys and 78% say it’s a good thing to encourage boys to do things that are thought to be more girl-like. Fewer Republicans say the same: 66% say it’s a good thing to encourage girls in this way and 47% say the same about boys. Democrats feel more strongly about this than Republicans. 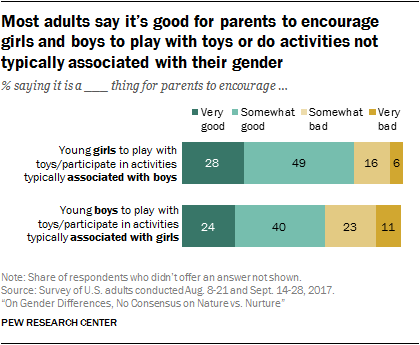 For example, 34% of Democrats but only 10% of Republicans say it’s a very good thing for parents to encourage boys to play with toys or participate activities normally associated with girls. Among Republicans 52% say this is a bad thing, including 17% who say it’s a very bad thing. Americans have different views when it comes to how much emphasis there should be in encouraging certain traits and behaviors in boys versus girls. The biggest difference can be seen on encouraging children to talk about their feelings when they are sad or upset. Roughly six-in-ten adults (59%) say there is too little emphasis on this in raising boys today; 29% say the emphasis is about right and 11% say there’s too much emphasis on this. Far fewer adults (38%) say there’s too little emphasis on encouraging girls to talk about their feelings; 51% say the emphasis is about right and 11% say there’s too much emphasis. On the other hand, 54% of adults say there is too little emphasis on encouraging girls to stand up for themselves. Fewer than half (40%) say there’s too little emphasis on encouraging boys to stand up for themselves. Similarly, when it comes to encouraging children to be leaders, Americans are more likely to say there is too little emphasis on this in raising girls than they are to say the same about raising boys. About half (53%) say there is too little focus on encouraging girls to be leaders; 41% say the same about boys. About half of the public (51%) says there needs to be more emphasis on encouraging boys to do well in school. A somewhat smaller share (43%) says the same about girls. There are some significant gaps between men and women in views on these issues. Women are more likely than men to think both boys and girls should be encouraged more to share their feelings. Two-thirds of women, compared with 52% of men, say there is too little emphasis on this for boys. Similarly, 45% of women, but only 30% of men, say there is too little emphasis on this for girls. While a greater share of men than women say there is not enough emphasis on encouraging boys to be leaders (46% of men compared with 38% of women), just the opposite is true for girls. More women (57%) than men (49%) say there is too little emphasis on encouraging girls to be leaders. Millennial women stand out in this regard: 68% say that there needs to be more emphasis on this compared with 55% of Gen X women, 53% of Boomers and 44% among the Silent Generation. Women are more likely than men to say that girls don’t get enough encouragement to do well in school (48% of women vs. 37% of men). Men, on the other hand, are more likely than women to say boys need more encouragement to stand up for themselves (45% of men say there is too little emphasis on this for boys, compared with 35% of women). Among men, those who describe themselves as very manly or masculine are particularly likely to say boys should be more encouraged to be leaders – 61% of these men say there is too little emphasis on this for boys, compared with about 40% or less of men who do not describe themselves this way. Men who see themselves as very masculine are less likely than other men to say there is too little emphasis on encouraging boys to talk about their feelings: 44% say this, compared with 55% of men who describe themselves as somewhat masculine and 63% of those who say they are not too or not at all masculine. Women who see themselves as very feminine or womanly seem to have fewer concerns about how girls are being raised these days than women who describe themselves as less feminine. For example, roughly half of women who say they are very feminine (48%) say there is too little emphasis on encouraging girls to be leaders; a significantly larger share (63%) of women who describe themselves as somewhat or not too or not at all feminine say there is too little emphasis on this. And, while 46% of very feminine women say there is too little emphasis on encouraging girls to stand up for themselves, 63% of women who describe themselves as less feminine say the same. Republicans and Democrats are also divided over the extent to which these traits and behaviors should be emphasized in raising boys and girls. There’s a particularly large gap when it comes to encouraging boys and girls to be leaders. A majority of Republicans (56%) say there is too little emphasis on this trait for boys; only 30% of Democrats agree. For their part Democrats are much more likely than Republicans to say there is too little emphasis on leadership for girls – 64% of Democrats say this compared with 39% of Republicans. Similarly, while more Republicans (49%) than Democrats (33%) say there is too little emphasis on teaching boys to stand up for themselves, just the opposite is true when it comes to girls. Roughly six-in-ten Democrats (63%) say there’s too little emphasis on this for girls, compared with only 43% of Republicans. Democrats are more likely than Republicans to say there’s too little emphasis on encouraging both boys and girls to talk about their feelings. And Democrats are more likely than Republicans to say girls should receive more encouragement to do well in school.